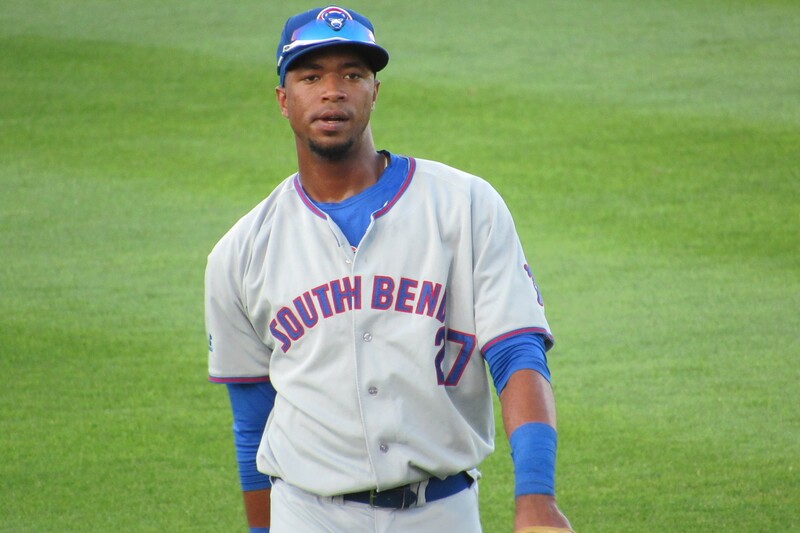 South Bend Cubs outfielder Eloy Jimenez and Cedar Rapids Kernels RHP Eddie Del Rosario respectively were named the Midwest League offensive player and pitcher of the week for the period of July 25-31. In seven games during that period, Jimenez batted .600 (15-for-25) with two homers, four doubles, 10 runs batted in, and seven runs scored. On Friday he went 4-for-5 with two doubles and a grand slam in South Bend’s 11-7 win over the Lake County Captains. The Chicago Cubs prospect is batting .342 with 12 HR and 70 RBI in 93 games with South Bend this season. Del Rosario made one start last week (on Friday), scattering two hits and four walks while striking out 11 batters in six scoreless innings versus the Kane County Cougars. The Kernels won the game 4-0. The Minnesota Twins prospect is 3-2 with a 4.61 ERA, 45 strikeouts and 24 walks in 54.2 innings (10 starts) for the Kernels this season. This entry was posted in Cedar Rapids Kernels, Kane County Cougars, Lake County Captains, Midwest League, South Bend Silver Hawks. Bookmark the permalink.